Akmal Ikramovich Ikramov (1898–1938) was an Uzbek politician active in Uzbek SSR politics and served as the First Secretary of the Central Committee of the Communist Party of Uzbekistan from 1929 to 1937. Ikramov was born in 1898 in an Uzbek family in Tashkent, then part of the Russian Empire. In 1918 he joined the Communist Party. From 1921 to 1922 he was secretary of the Central Committee of the Communist Party of Turkestan. In 1922 he moved to Moscow where he studied at the Sverdlov Communist University. While in Moscow, Ikramov kept on campaigning within the Party for raising the cultural level of Turkestan by increasing literacy and building more schools. Meanwhile, Ikramov became involved in a power struggle among the Communists between those favoring a Pan-Turkist government like Turar Ryskulov, and those in favor of dividing the Turkestan Autonomous Soviet Socialist Republic into smaller ethnic or regional units, such as Fayzulla Khodzhayev and Ikramov. The latter group won, as national delimitation in Central Asia began in 1924. In January 1925 he became secretary of the Tashkent Oblast committee in the newly formed Uzbek Soviet Socialist Republic and was also for a time active as chief editor of the magazine Communist. In 1929, he became First Secretary of the Communist Party of Uzbekistan and thus de facto head of government in Soviet Uzbekistan. He was the first ethnic Uzbek in this office, which he held until 1937. In 1930 his predecessor Isaak Zelensky tried to depose him, but since the Central Committee supported Ikramov, this attempt failed. 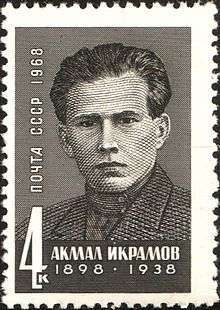 Like many other early Communists, Ikramov fell victim to Stalin's Great Purge. Together with Khodzhayev he was arrested in 1937 and accused of anti-Soviet, Trotskyist activities, like being connected with agents of the British Intelligence Service. In the following Case of the Anti-Soviet "Bloc of Rights and Trotskyites" Ikramov confessed being a British spy, and was quoted saying: "We had to rely on a strong European Power to help us. We thought England most reliable because she is so strong." He was sentenced to death and shot on 13 March (other sources indicate 15 March) 1938. During the Khrushchev Thaw, Ikramov's son Kamal requested that the first secretary of Uzbekistan rehabilitate his father. The secretary brought the case to Nikita Khrushchev personally, who then asked Vyacheslav Molotov to look at it. After a year, in 1957, Akmal Ikramov was reinstated in the Party, although the document reinstating him was classified as "Confidential." ↑ Fourth Conference of the Central Committee of the R.C.P.(B.) with Responsible Workers of the National Republics and Regions; June 9-12, 1923; response by Stalin: "I take upon myself some of the charges Ikramov made against the work of the Central Committee, to the effect that we have not always been attentive and have not always succeeded in raising in time the practical questions dictated by conditions in the Eastern republics and regions. Of course, the Central Committee is overburdened with work and is unable to keep pace with events everywhere. It would be ridiculous to think that the Central Committee can keep pace with everything. Of course, there are few schools in Turkestan. The local languages have not yet become current in the state institutions, the institutions have not been made national in character. Culture in general is at a low level. All that is true. But can anybody seriously think that the Central Committee, or the Party as a whole, can raise the cultural level of Turkestan in two or three years?" ↑ Yalcin, Resul (2002). The Rebirth of Uzbekistan: Politics, Economy, and Society in the Post-Soviet Era. Garnet & Ithaca Press. pp. 36–38, 163–164. ↑ "Soviet "purge" continues". Yorkshire Post and Leeds Intelligencer. British Newspaper Archive. 14 October 1937. Retrieved 6 September 2015. (subscription required (help)). ↑ "Soviet mass trial". Sunderland Daily Echo and Shipping Gazette. British Newspaper Archive. 2 March 1938. Retrieved 6 September 2015. (subscription required (help)). Ikramov, Akmal’ Ikramovich article from The Great Soviet Encyclopedia, 3rd Edition (1970-1979).